Menaggio is a town and comune in the province of Como, Lombardy, northern Italy, located on the western shore of Lake Como at the mouth of the river Senagra.Menaggio has three frazioni (parishes): Croce, Loveno and Nobiallo.HistoryThe area of current Menaggio was conquered by the Romans in 196 BC. Kick off your visit on the 10th (Mon): take a stroll through Menaggio, tour the pleasant surroundings at Spiaggia Tranquilla, and then choose your vessel at Turati Centro Nautico Lario. Here are some ideas for day two: admire the landmark architecture of Villa del Balbianello, kick back and relax at Riva Bianca Beach, and then admire the landmark architecture of Villa Monastero. For reviews, ratings, and other tourist information, go to the Menaggio day trip site . Reykjavik, Iceland to Menaggio is an approximately 9.5-hour flight. You can also drive. The time zone difference moving from Greenwich Mean Time to Central European Time is 1 hour. When traveling from Reykjavik in June, plan for much hotter days in Menaggio, with highs around 32°C, while nights are somewhat warmer with lows around 19°C. Finish up your sightseeing early on the 11th (Tue) so you can travel to Milan. Kick off your visit on the 12th (Wed): make a trip to Galleria Vittorio Emanuele II, then take in the spiritual surroundings of Duomo di Milano, and then step into the grandiose world of Castello Sforzesco. For maps, traveler tips, reviews, and more tourist information, read Milan trip itinerary app . You can drive from Menaggio to Milan in 2 hours. In June, plan for daily highs up to 33°C, and evening lows to 20°C. Finish your sightseeing early on the 12th (Wed) to allow enough time to take a train to Verona. 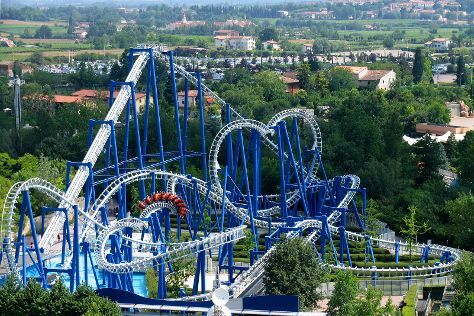 Attractions like Arena di Verona and Gardaland Park make great kid-friendly stops. There's still lots to do: step into the grandiose world of Museo di Castelvecchio, contemplate in the serene atmosphere at Basilica di San Zeno Maggiore, take a stroll through Piazza delle Erbe, and don't miss a visit to Liston. To see other places to visit, photos, and tourist information, read our Verona travel planner. You can take a train from Milan to Verona in 1.5 hours. Alternatively, you can drive; or take a bus. June in Verona sees daily highs of 34°C and lows of 20°C at night. Wrap up your sightseeing on the 15th (Sat) to allow time to take a train to Venice. Attractions like Canal Grande and Doge's Palace make great kid-friendly stops. Explore the numerous day-trip ideas around Venice: Padua (Basilica di Sant’Antonio & Scrovegni Chapel). There's still lots to do: get to know the fascinating history of St. Mark's Square, explore the world behind art at Peggy Guggenheim Collection, examine the collection at Museo Ebraico di Venezia, and admire the striking features of Basilica di San Marco. To find maps, reviews, traveler tips, and other tourist information, read our Venice itinerary site . Getting from Verona to Venice by train takes about 1.5 hours. Other options: drive; or take a bus. In June, daily temperatures in Venice can reach 32°C, while at night they dip to 20°C. Wrap up your sightseeing on the 19th (Wed) to allow time to take a train to Florence. You'll visit kid-friendly attractions like Cathedral of Santa Maria del Fiore and The Boboli Gardens. Dedicate the 23rd (Sun) to wine at some of the top wineries in the area. Next up on the itinerary: explore the world behind art at Uffizi Galleries, see the interesting displays at Galleria dell'Accademia, snap pictures at Ponte Vecchio, and take an in-depth tour of Basilica di Santa Croce. To find photos, ratings, traveler tips, and more tourist information, use the Florence road trip planning site . Traveling by train from Venice to Florence takes 2.5 hours. Alternatively, you can drive; or take a bus. In June in Florence, expect temperatures between 33°C during the day and 21°C at night. Finish your sightseeing early on the 23rd (Sun) to allow enough time to drive to Assisi. On the 24th (Mon), stroll through Parco del Monte Subasio, step into the grandiose world of Rocca Maggiore, take in the architecture and atmosphere at Basilica inferiore di San Francesco d'Assisi, pause for some serene contemplation at Chiesa Santo Stefano, then examine the collection at Museo della Porziuncola, and finally learn about winemaking at Azienda Agraria Saio. On your second day here, take in the spiritual surroundings of Cripta di San Francesco, take in the spiritual surroundings of Santa Maria delle Rose, take in the spiritual surroundings of Eremo delle Carceri, then pause for some serene contemplation at Basilica Superiore di San Francesco d' Assisi, then do a tasting at Tili Vini Societa Agricola, and finally take in the spiritual surroundings of San Damiano. To see more things to do, reviews, where to stay, and other tourist information, you can read our Assisi trip itinerary site . Drive from Florence to Assisi in 2.5 hours. Alternatively, you can take a train. Traveling from Florence in June, Assisi is little chillier at night with lows of 18°C. Wrap up your sightseeing on the 25th (Tue) early enough to drive to Rome. Kids will enjoy Colosseum and Palatine Hill. There's lots more to do: admire the local landmark of Trevi Fountain, steep yourself in history at St. Peter's Basilica, don't miss a visit to Roman Forum, and admire the striking features of Pantheon. To find ratings, reviews, other places to visit, and tourist information, use the Rome day trip planning tool . You can drive from Assisi to Rome in 2.5 hours. Other options are to take a train; or take a bus. In June, daytime highs in Rome are 34°C, while nighttime lows are 21°C. Wrap up your sightseeing on the 30th (Sun) to allow time to travel back home.